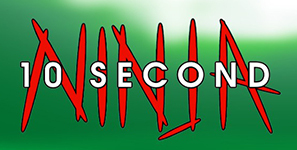 I'd looking forward to 10 Second Ninja for a while before release. Since @GameDesignDan's involvement in the wonderful Castles in the Sky I've been keeping my eye on his work. 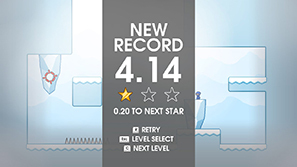 Unfortunately, 10 Second Ninja is an underwhelming experience despite having so many promising elements. You are a ninja. You need to defeat Robot Hitler and his hoard of useless robot guards. Each stage presents you with a different layout and number of guards that you need to eliminate within 10 seconds using either your sword or shurikens. Your performance is rated on a three star award; three being the fastest. You will rarely aim to get anywhere near 10 seconds, below 4 is frequently the par. It starts really well. The levels are simple in layout but it will take some progression to get used to the techniques needed. 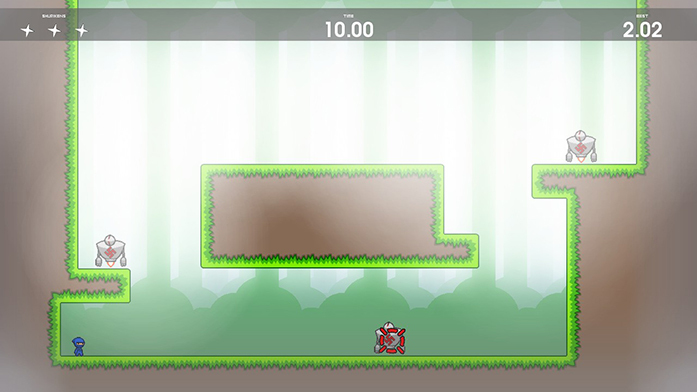 It is up to the player to work out the best route and method to clear the level. You can restart instantly by hitting a button, something you'll do a lot. The controls are tight and responsive. A controller is highly recommended. The addictive nature of the gameplay hits immediately. 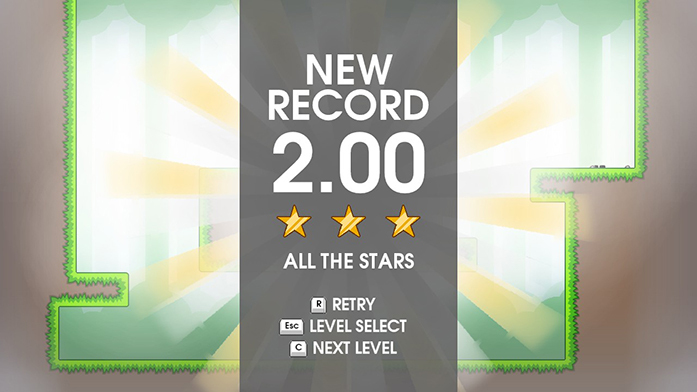 The first level's three star rating is 2 seconds. I repeated this level time and time again before moving on, not able to hit the time. The message of 0.02 seconds till next star is tantalising and frustrating at the same time. After moving on I returned later and managed the time with ease. It takes a while before you start getting three star ratings but it becomes much easier later on, due to both player improvement, and poor level design which spells out which route you must take. This was one of my biggest frustrations. The fun for me was stopping for a moment (the timer on a level doesn't start till you make your first move) and working out a strategy, testing it, then either trying again and again to get faster or choosing a new method. The introduction of interactive elements; such as falling stalactites, that both destroy enemies and serves as a new platform, and colour co-ordinated portals remove the possibility for variety in approach. Later on, in the fourth and final set of story levels, I was getting three stars on my first attempt without much thought or problem. 10 Second Ninja is short. 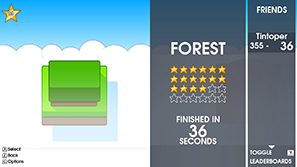 I finished the four story areas in 48 minutes with only one more star needed to unlock the first set of bonus levels. The bonus levels are more difficult than the story missions but still relatively easy. But rushing through all the levels isn't the point; getting those three star ratings on each level is the main prize here. It is rewarding to finally get that three star rating that you were aiming for for so long but a bit of a slog to go through each level. It only tells you your withstanding star rating in the menu so you have to quit out, check your stars, then start the level again. The art style is minimalistic and functional, ideal for this kind of game where you don't want to be distracted by anything superfluous. However, I take issue with some of the thematics. On the final world there are swastikas everywhere. Dozens are on display on each stage and this is distracting, unpleasant and unnecessary. 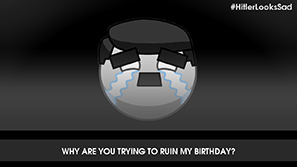 In fact, the entire Robot Hitler motivation adds nothing to the game; it would be better off without it. Story and character motivation are not the appeal in this game. The game runs pretty well. I encountered two bugs so far; one fatal error, crashing the game, and upon the final strike on Robot Hitler my controller would not stop vibrating. I ended up having to skip the credits and exit out the game. 10 Second Ninja was a big disappointment for me. I was hoping for something far more challenging and fun, rather than a slog through simplistic puzzles without ever really getting going. I will probably try and get three stars on all levels but after that, unless theres some interesting additions made, I will likely not play again. Such a shame. Still, Dan Pearce should be commended. This is a valiant effort for a solo project with a great premise with promising potential. It just doesn't gel together to make a rewarding gaming experience.